Oscar Fingal O'Flahertie Wills Wilde was a poet, playwright, novelist, essayist, short-story writer and master of the epigram and one-liner. He is now considered one of the major writers of the late nineteenth century, and is best known for the Gothic novel, The Picture of Dorian Gray (1891), fairy tales, and a series of scintillating comedies culminating in his masterpiece The Importance of Being Earnest (18940). He was born in Westland Row, and lived in No. 1 Merrion Square, and attended Portora Royal School, Trinity College Dublin (1871-74) and Magdalen College, Oxford (1874-78). 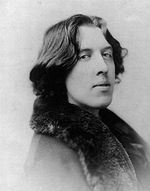 Wilde became a figure of both adulation and notoriety for his promotion of Aestheticism and the scandalous subject matter of his writing, though he was also one of the major social figures of the time and is now considered an early 'celebrity'. 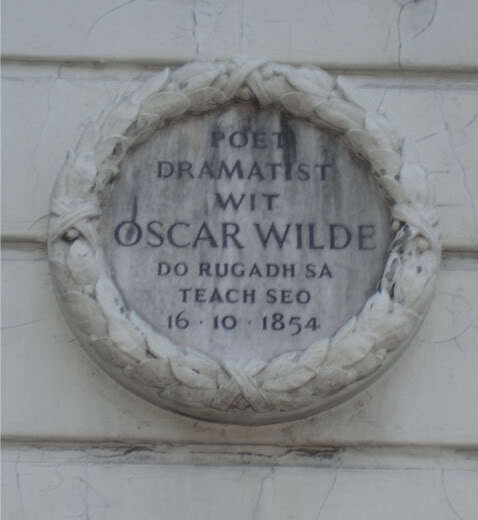 In 1954 a plaque was placed on the wall of 21 Westland Row to commemorate the birth of Oscar Wilde. It was designed by playwright and actor Mícheál Mac Liammóir and unveiled by the playwright Lennox Robinson. 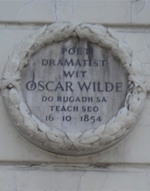 The Oscar Wilde Centre for Irish Writing also hosted the immensely successful Wilde Legacy Symposium in December 2000. 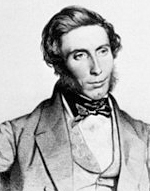 Dr. William Wilde, Oscar's father, was one of the leading ENT specialists of his time. He is acknowledged internationally as a pioneer in the field of otolaryngology, having written the first clinical textbook on the subject. He was knighted for this and for his work as a medical statistician. He also had a reputation as an antiquarian and archaeologist, being an expert on the subject of Irish pre-history. As well as being a medical historian, and among the leading figures in the Celtic Revival, he was also a biographer, and wrote a book on the later years of the author Jonathan Swift. He also wrote a fascinating book on a journey he undertook to the Middle East in 1837 during which he climbed to the top of the Great Pyramid at tremendous personal risk. Jane Wilde, Oscar's mother, who wrote under the pseudonym Speranza, was also a remarkable individual in her time. She was brought up as a Unionist but she became closely associated with the Young Irelanders, which numbered individuals such as Thomas Davis, William Smith O'Brien and Charles Gavan Duffy. She also wrote revolutionary poetry for 'The Nation' newspaper. Speranza subsequently became a leading society hostess in Dublin. 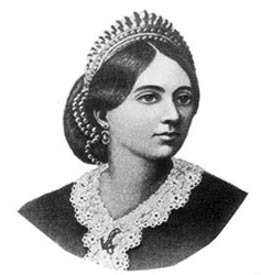 She was an early champion of women's rights and was fluent in a number of languages, allowing her to translate several poems and books. 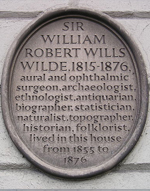 The Wildes' house at 21 Westland Row attracted some of the leading figures in art, literature, science and medicine of the time - including John Hogan, Samuel Ferguson and William Rowan Hamilton.